Bear in mind that BGVs are scent hounds, bred over hundreds of years for their ability to use their nose to track. Those that are extremely well trained to reliably come back on recall are few and far between as their noses take over from their brains. Therefore when exercising, unless you are in a securely enclosed area or one where your BGV can come to no harm, it is often better and safer to use a flexi-lead. Being a hound breed, they do need regular exercise, not only to stimulate their brains but also to use their noses in different areas. However they are also creatures of habit. Once any BGV has enjoyed a long walk, he will settle down quite comfortably. 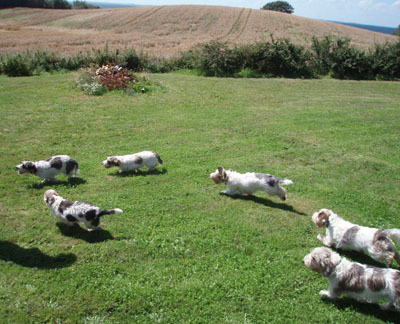 Being a shorter-legged breed, puppies should be exercised sparingly during the first few months off their life whilst their bones and joints are forming. Any jarring on the front limbs will result in deformation or injury. As with almost all breeds BGVs have some health issues and a good breeder will take time to discuss these with you. You are also encouraged to research the breed carefully and to ask lots of questions. These do tend to be similar or fall into certain categories, so below are answers to all those questions you might have wanted to ask which will hopefully help you in making your decision. What is a BGV really like? Both types are active, curious, busy, happy, alert, independent and intelligent. They are willing to please, affectionate and demand attention. 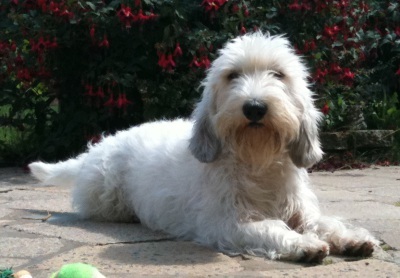 Although stronger, GBGVs are probably more laid back than their busier, livelier, smaller PBGV cousins. As scenthounds, they are pack animals so happy with others of their own kind. Can you train them? With understanding and time BGVs are not hard to train, although the Grand does need firm handling. The bonus is that they have a desire to please. The level of learning depends on the amount of time you can devote. However remember that these are scenthounds. If they get on the trail of something, they will become deaf to your calls and only return when ready. What can you train them to do? House-training and basic obedience to learn good manners come first. A BGV may be purely a loved family member or there are other activities it is capable of. With extra training, many become show dogs or compete successfully in other events such as obedience, tracking, agility and heelwork to music. A few are used in Search and Rescue and as therapy dogs. Some are achieving high standards in the Kennel Club Good Citizen Dog Scheme. Do they bark much? Most BGVs only bark if they have a reason to. They do not just bark for nothing. Are they destructive? Like any dog, a bored or lonely BGV will make his own entertainment. To avoid coming home to find damage, a variety of safe toys, things to chew on and a safe enviroment will lessen the opportunity for him to be destructive. A dog crate is useful - your BGV's special place where he feels secure for a short period of time. Leave the door open for him to get used to it. 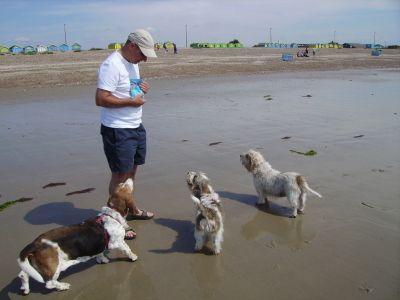 Can you let them off the lead? Many say "Don't let your BGV off the lead". It depends on the nature of the particular dog, also on early training. If you decide to let yours run free, do it somewhere well away from roads or areas where there are sheep or other farm animals. An enclosed area is ideal. Encourage him to return from short distances, offering a treat as a reward. Remember that the hunting instinct is very strong and noses do tend to take over from their brains. One small scent and your hunter will be off on the chase. If you stand your ground, he will eventually return - but how long are you prepared to wait? Flexi-leads are a good alternative! Are they good with children? BGVs generally love everyone and have a natural affinity with children. 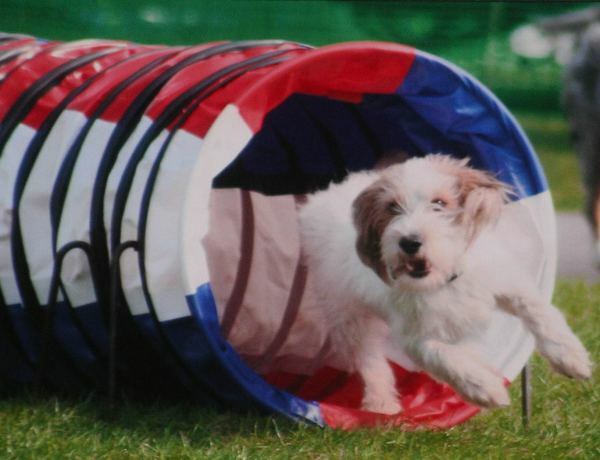 Some children compete with them in Young Kennel Club handling competitions at shows. 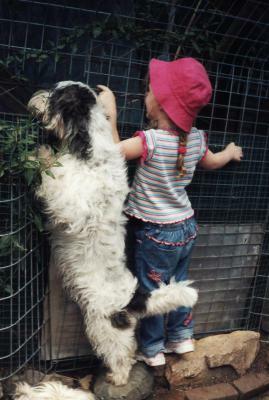 As with any dog, you should never leave a child and your BGV together unattended. If your BGV is asleep, don't let a child poke him and do not allow teasing as these actions will provoke an undesirable response. Will I need a fenced back garden? To be worry-free when your BGV is in the garden you need a secure fence, ideally about 2 metres (6 feet) high. As some BGVs dig, consider putting wire netting at an L shape down the bottom of the fencing and buried into the ground. If your BGV digs, his nails will meet the netting. Check your boundaries regularly. If an animal, such as a fox, digs in this gives your BGV a means of escape. Can a BGV live in a flat or apartment without a garden? This isn't an ideal situation. A ground floor flat with access to a garden presents no problems. But anyone living higher up must consider seriously if this is fair on the dog. Can you give him regular exercise or allow roaming free? A BGV needs regular exercise and just taking a dog out on a lead to relieve himself is not sufficient. Numerous dog walks each day would be needed at a bare minimum and putting your shoes and coat on to take the dog our in all weathers, especially before bed, may soon become irritating. If I want more than one, would they get along together? Would a BGV settle with my current family pet? For fans of the breed, one BGV is wonderful, two an absolute joy. They provide mutual company and entertainment. However, if you want more than one, consider waiting or varying their ages. Otherwise, in years to come, you will have two old ones with the attendant problems and upset. If you have another breed already, a new BGV introduced on neutral ground will invariably be sociable and your existing family dog will be taking his new friend back to his home. They also normally befriend other family pets or dogs entering the home. How do I care for a BGV's coat? His coat should be thick, harsh and somewhat casual looking. A weekly brushing will remove loose and dead hair. A pin brush and possibly a mat breaker, which will help remove any little knots, are essential. And, unless you are going to remove excess hair with finger and thumb, you should also have a stripping knife. Bath him as necessary. What about other grooming? Nails need clipping regularly and ear canals kept free of excess hair and wax. Teeth need regular care to be kept clean and free of tartar. Trim long hair under the feet and check between the pads for unwanted material or mats. And, if you show your dog, or want to keep him looking characteristic of the breed, there is a lot more to it! At a minimum, keeping that unrefined, rustic look means making sure this is no excess hair covering the eyes, removing long, untidy hair from the ends of the ears and keeping the feet tidy.You can achieve this, and tidying up the body, by plucking hair out with finger and thumb or using a stripping knife. The breeder will be pleased to show you how to do this. Are BGVs healthy? 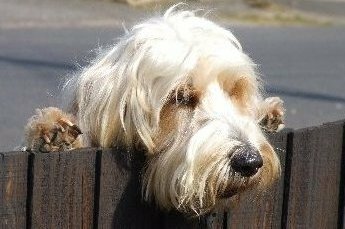 Both the PBGV and GBGV suffer from the usual "doggy" health problems, most of which can be prevented or cured by prompt veterinary attention. When thinking about more serious ailments, in general both are extremely healthy breeds. However if is always wise to consider insurance to cover any unexpected illnesses or accidents. Are there any specific health problems that I should be concerned about? Any breed can be subject to genetic and/or birth defects. A few conditions have been reported in BGVs such as juvenile pain syndrome (asceptic meningitis), heart murmurs, epilepsy and some eye conditions. 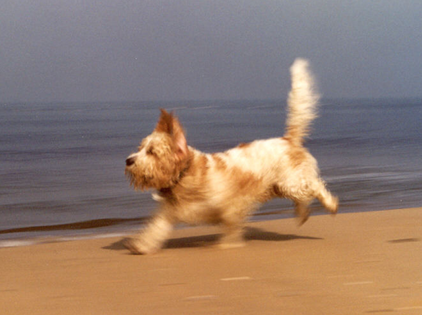 In conjunction with the breed World Health Committee, the BGV Club committee monitors all these extremely carefully, especially the known slight incidence of epilepsy in Petits and Grands and Primary Open Angle Glaucoma in PBGVs, which can now be detected by DNA testing. The club also promotes regular eye testing. Before you buy, talk to the breeder if you have any concerns about health issues. Where appropriate, ask for evidence of DNA testing or of eye testing of sire and dam and, when buying, get certification of current good health of the puppy. Ask your own vet to examine your puppy to confirm that it is healthy and has no heart, eye, ear or other abnormalities. What is the life expectancy? You should expect an average life-span of 12-14 years or more. What do BGVs eat? BGVs are easy to feed. Giving the recommended amount of good quality dog food (either complete or canned) and a small quantity of dog treats will normally satisfy nutritional needs. Some owners prefer to feed their dogs raw food primarily of uncooked meat, edible bones and organs. You should take advice on this and what you should not feed raw. 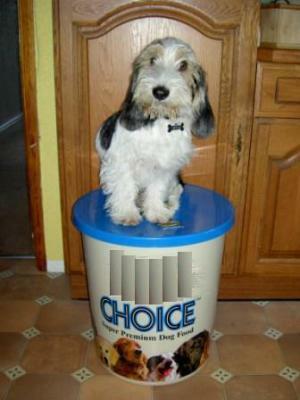 Supplements of special foods should be used only on the recommendation of your vet. Where can I find a puppy? The Breeders Directory on this website lists BGV Club members who occasionally have litters. Alternatively, the Kennel Club lists those breeders who belong to their Assured Breeder Scheme. Is it possible to obtain an older, already trained BGV? Sometimes breeders have older dogs to re-home. This may be for a variety of reasons - perhaps one not being shown any more, no longer being bred from or purely when numbers creep up in the domestic environment. 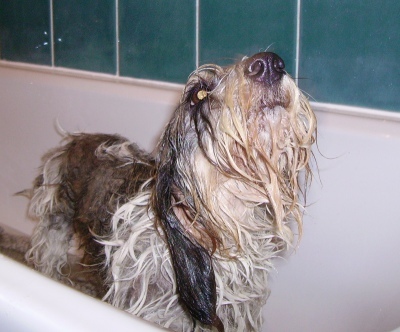 It is always hard for a breeder to let a loved PBGV go but one especially that has lived in kennels deserves a comfy bed in its older years. Most breeders stay in touch with the new owners, who become good friends, and they still see the BGVs who were a big part of their lives. The Club Welfare & Rescue Co-ordinator may also know of a BGV looking for a home. they were nicknamed "The Happy Breed".